Often there are geographical features or direct references to places that have given today's streets their names. So marked the "Feindhag", the small street behind us, the boundary between the actual location and the free surrounding fields. A thorn hedge protected here as a "last line" the village before the first houses and industrial plants were built outside. 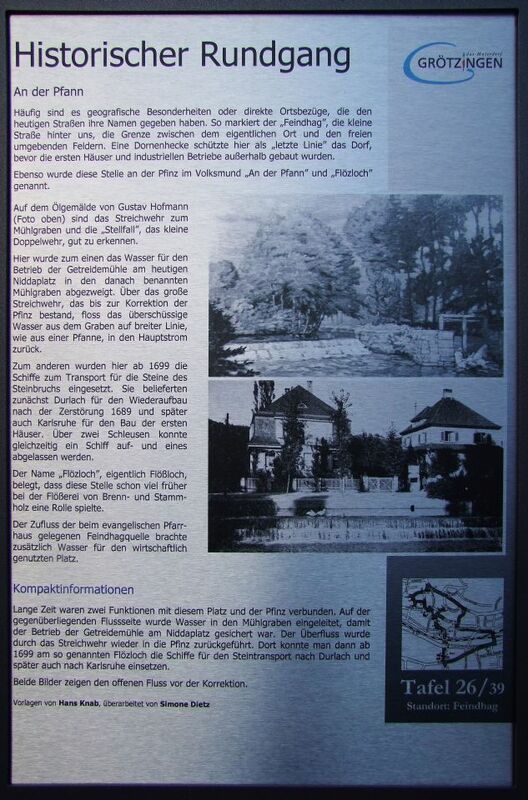 Likewise, this site was called at the Pfinz popularly known as "An der Pfann" and "Flözloch". The oil paintings of Gustav Hofmann (photo above) are the weir and mill race for the "control case", the small double weir, easy to recognize. Here the water was diverted for the operation of grain mill today Nidda place in a mill race named after the one. The large spillway, which existed until the correction of Pfinz, flowed the excess water out of the ditch on a broad front, like a frying pan, into the main stream back. Secondly, the ships were used to transport the stones of the quarry here in 1699. They first supplied Durlach for reconstruction after the destruction in 1689 and later Karlsruhe for the construction of the first houses. Simultaneously via two locks could a ship up and one to be drained. The name "Flözloch", actually Flößloch, proves that this place earlier played much a role in the rafting of firewood and logs. The influx of evangelical rectory located at Feindhagquelle brought additional water for agricultural use place.